As anyone who was paying attention during the recent Yom Kippur services will tell you, one must seek repentance on their own. In Judaism, there are three ways to atone for sins: asking for forgiveness, praying, and giving charity. Nowhere in Jewish law does it say that a friend can ask for forgiveness on your behalf. That’s precisely what actor Robert Downey Jr. attempted to do on Friday during the American Cinematheque Awards Friday in Los Angeles. 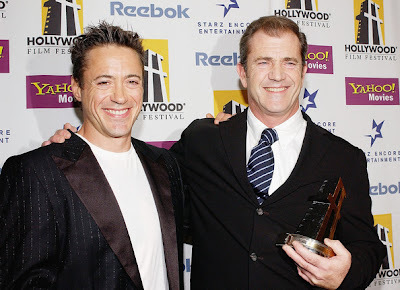 Downey Jr. urged the Hollywood community to forgive Gibson for his recent troubles, which include anti-Semitic rants, racial tirades, and spousal abuse. At least one rabbi has spoken out against Downey Jr.’s attempts to gain forgiveness from his Hollywood colleague. The Simon Wiesenthal Center’s Rabbi Marvin Hier, said that only Mel Gibson can seek and receive forgiveness for his sins. “The sins between man and his fellow man can only be forgiven if the person who committed the sin asks for forgiveness from those whom he shamed and insulted and caused harm to,” Hier said Monday. Mel Gibson practices the "old school" Pre-Vatican II catholivism which still contains all of the anti-semitism of old- pefidious Jews reference in their Mass, etc. Feh ! !